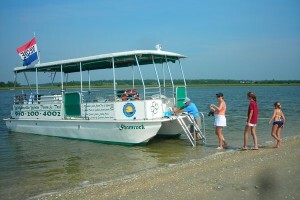 The Fred and Alice Stanback Coastal Education Center is a regional hub for coastal education offering a wide range of events, classes and fun activities. Visit the federation’s calendar of events to for more information on our programs and events. The center is open Monday through Friday from 9 a.m. to 5 p.m. We invite you to stop by and join in one of our activities. The center demonstrates a series of stormwater reduction measures that students can investigate and learn about their connection to our waterways. This is also the jumping off point for the interactive Walk the Loop for Clean Water education project. Students are engaged with hands-on experiments and exploration using the stormwater reduction projects at the center and around the loop. Field programs for students occur through the center and at our habitat restoration sites in the region. The center houses a classroom and is adjacent to the salt marsh and tidal creeks which serve as living laboratories. We also host field trips to our restoration sites where students can help build and maintain oyster reefs and monitor and plant salt marsh grasses. Students explore these habitats and projects to understand their function and values. Contact Ted Wilgis, coastal education coordinator, at 910-509-2838 or tedw@nccoast.org for more information. Join us in the field as we explore our coastal treasures: Walk the Loop for Clean Water, tour a salt marsh and learn about living shorelines. Visitors can reach out and touch hermit crabs, sea squirts, sea stars, and other creatures while learning how to keep our coastal ecosystems healthy. Every Tuesday, June through August, 10 a.m. to 1 p.m., free. To register or learn more contact: Jessica Gray at jessicag@nccoast.org or visit our event calendar. After many years of temporary housing, the southeast office of the federation has found a home. And what a home it is! 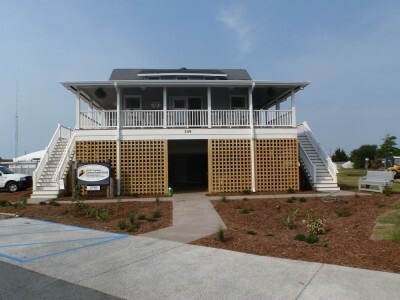 The Fred and Alice Stanback Coastal Education Center opened to the public on May 3, 2014 in Wrightsville Beach. 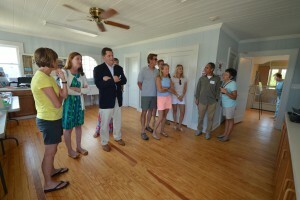 The federation’s education center and southeast offices are housed in an historic 1948 beach cottage that was donated to the federation. After a herculean effort by the entire community, the house was moved by barge to its current location in the Town’s Historic Square off West Salisbury Street (map). It’s not every new office that gets to take a cruise before it starts work! The Palmgren-O’Quinn cottage was renovated to include a classroom, education and art displays, public event space and offices for our staff and interns. The center’s grounds serve as a “Living Classroom” with native plants, rain gardens, stormwater reduction demonstrations, low-impact development landscaping, and hosts of other projects. Donations and volunteer support from residents, visitors, businesses and foundations made this project possible. We welcome all—please stop by. 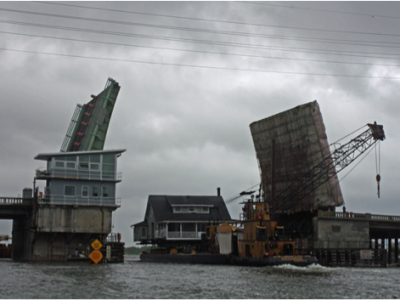 View photos of the project on our Facebook page and watch the video of house’s journey around Harbor Island by barge. 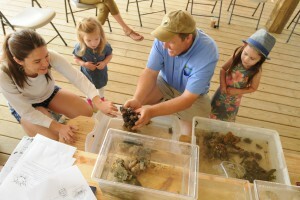 As a regional hub for coastal education, the center will offer a wide range of events, classes and fun activities. Visit our calendar of events to register or find more information about our programs and events. The center is open Monday through Friday from 9 a.m. to 5 p.m., so come by, call 910-509-2838 or email. Members receive discounts to all our events, and memberships support the work of the federation to protect our coast. Please consider joining the federation and Becoming A Partner in Protecting Our Coast.